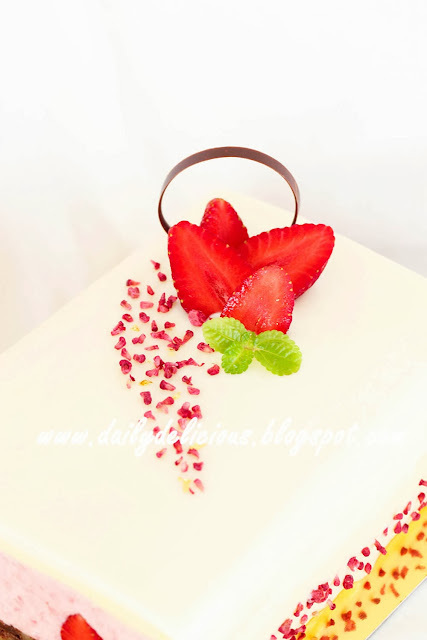 I draw a picture of this cake about 3 months ago (you can see it here), and I really want to make it. The only problem that kept me from making it is the size of the mold, I couldn't find the right one. 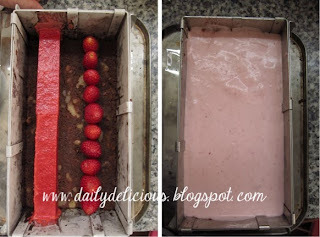 Because this cake needed to be set in the mold and freeze in 2 steps, first when making brownie and raspberry mousse and second when setting the vanilla mousse. Actually I want to make the brownie and raspberry mousse smaller, so the finished cake will be smaller too ^^", but after 2 month of searching I gave up on finding the right mold and use the one that I have. The adjustable mold that I use is 11x21.5cm and can become 20x40cm too, I use only one mold for this time. First I baked the brownie in the mold by adjusting it to 23x13 cm, I baked it larger and cut it so the brownie will fit perfectly. Then I use the the same mold to set the brownie with jelly, strawberry and raspberry mousse. And I adjusted it again to 13x23 cm. for the vanilla mousse. Well, it's quite a big cake for me than I imagine, haha, but I'm happy with it. 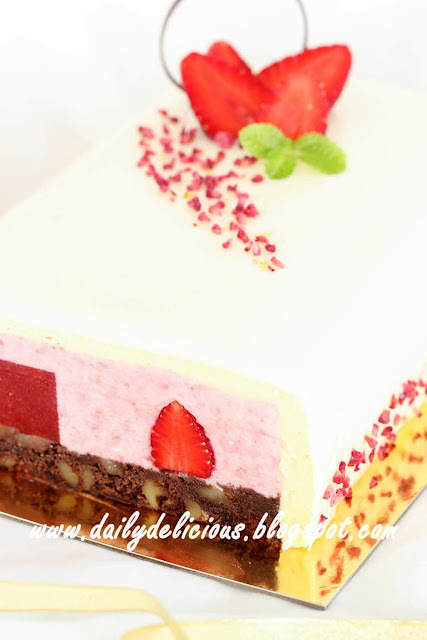 The reason that I made this cake because one of my friend came to visit me, I wanted to make her happy, so with the happiness as the key ingredient I name this cake "Joy" and I think it's suitable for this time of the year, I want to give this recipe as a New Year gift for all the readers (well, it's you). To thank you for your supporting, I'm happy to know many of you through my blog and my page ^^, and many people become very good friends (thank you too for many things, ^^). With facebook page I have a chance to appreciate some of your homework, knowing that my recipes make you and your family happy, and I share them on my page so that everyone will have a courage that they can make it too, hope that I can be one of many reasons that make you believe in cooking and baking by yourself. It's not easy for me to answer all the questions (there're a load of it), I try my best, but if you still didn't get my answer write to me again, your e-mail or your message might be somewhere in my mail box that I couldn't see it (or I forgot to answer it). 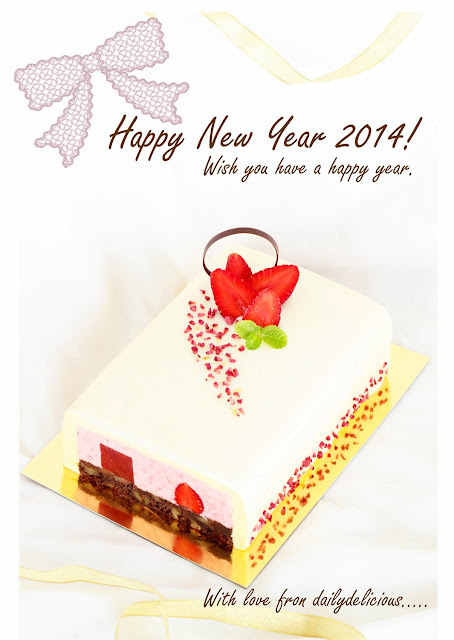 So, please accept my gift of "Joy", I wish you have a happy year (and happy every year ^^). Adjust the mold to 13x23 cm and line with baking paper. Melt the chocolate by putting in the bowl and place over the bowl of hot water (don't let the bottom of the bowl touch the water. Beat the butter with sugar and salt until light in color. Pour the egg into the bowl and beat to combine. Pour the flour and walnut into the bowl. Put the batter into the prepared pan. 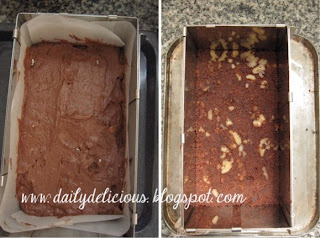 Let the brownie cool completely before cut into 11x21.5 cm, with 2cm height, and place in the mold. Mix the simple syrup with creme de framboise. Sprinkle the syrup over the brownie. Bloom the gelatin in the water (if using gelatin powder, mix the gelatin with 2 tbsp of water). 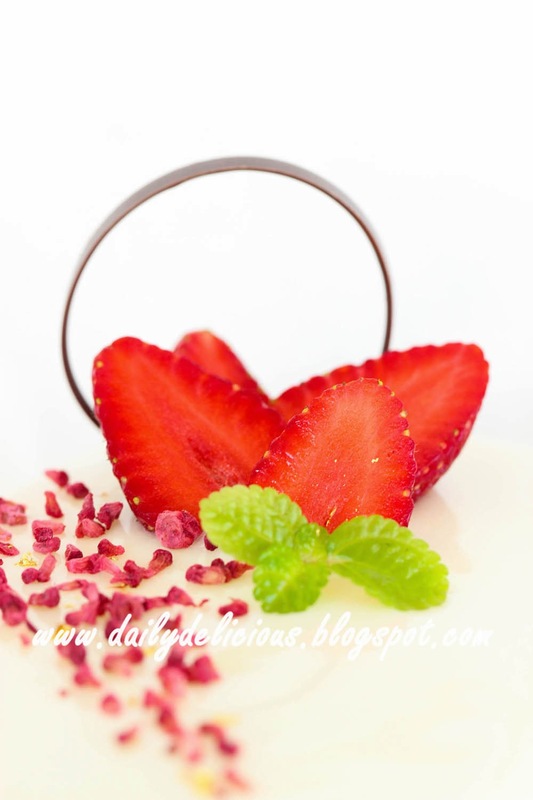 Put the strawberry in the food processor and process until smooth, pour the sugar into the strawberry and process again. Pour the mixture into small sauce pan, set over low heat. Heat the mixture until the sugar dissolve but not boil. 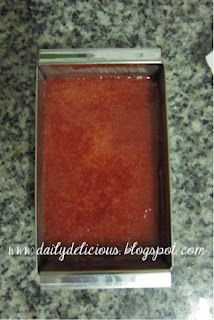 Take the pan out of the heat, then add the gelatin, stir until smooth. 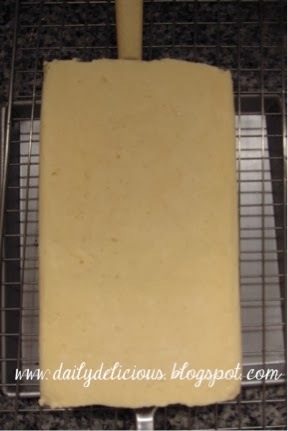 Pour the mixture into 8x12 cm pan, freeze until firm. 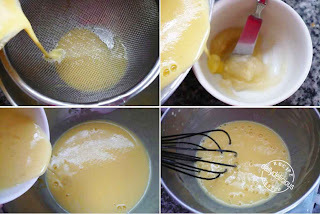 Put 80g of the puree into the microwavable glass or bowl, and heat for 30 seconds to 1 minute or until hot, put the gelatin in hot puree, stir to dissolve. Mix the hot puree with the rest of the puree and let it cool. Cut the jelly into long pieces and place the jelly over the brownie. Place the strawberries on the other side of the brownies. Pour the raspberry mousse over the brownie. Cover with plastic wrap and freeze until firm. In a small saucepan, bring the milk to a boil. 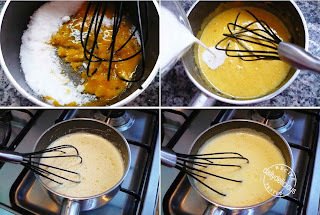 In the meantime, combine the yolks, sugar and seeds from vanilla pod together and whisk in a heavy‐bottomed saucepan. 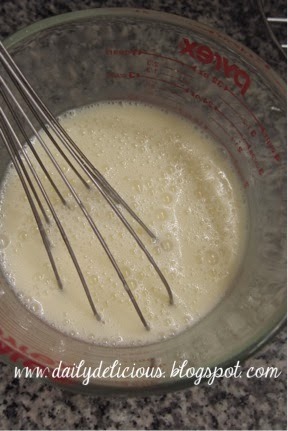 Place the pan over medium heat and whisk vigorously (without stop) until the mixture returns to a boil. Mix gelatin powder with Vanilla liquor. *If using gelatin sheets, bloom the gelatin in cold water then mix into creme anglaise after removing from the heat, and mix the vanilla liquor into the creme anglaise too. Pour ½ cup of the hot mixture into the gelatin mixture, stir to combine. Pour the gelatin mixture back to the bowl, stir to combine. Whisk cream just to soft peaks. Remove the Raspberry mouse from the mold and adjust the mold to 13x23 cm. Pour the vanilla mousse into the mold to cover the side and top of the raspberry mousse and brownie. In a sauce pan, put the sugar and water together, and bring to boil over medium low heat. Meanwhile boil the whipping cream and milk together, then turn off the heat. When the syrup reaches 110°C, take the pan out of the heat and slowly pour into the whipping cream pan, stir constantly until combine. Pour the glucose syrup and nappage into the pan, put the pan over low heat stir until combine. 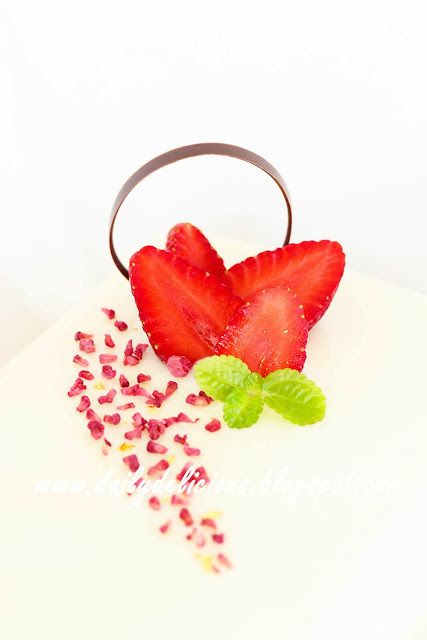 Let the glaze cool to 35-37°C before pouring over the cake, let the glaze set and decorate with fresh strawberry. spectacular and beautiful, great job, compliments! Happy New Year. Beautiful cake and great blogs.